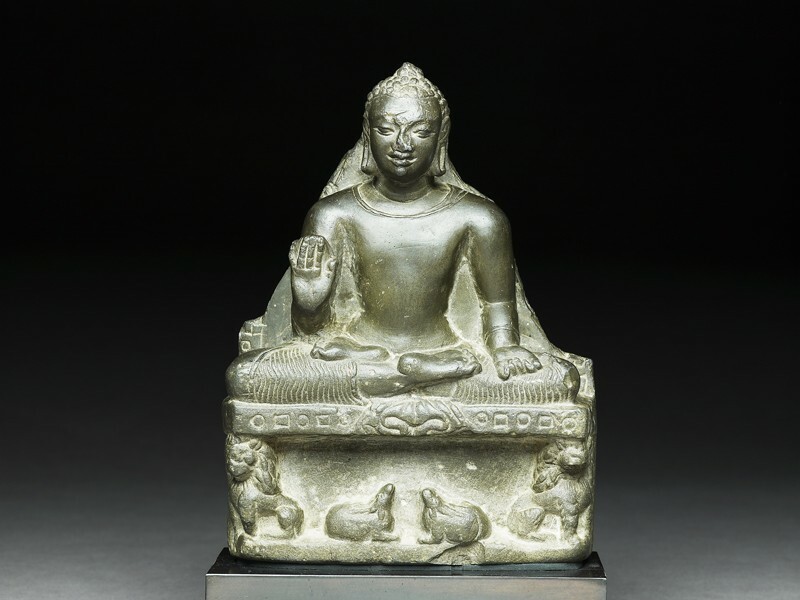 This Buddha image represents the pure Nepalese style of the Licchavi period under the influence of Gupta India. The heavy shoulders and broad chest are voluminous, yet without any sense of muscularity . The massive torso and the full face with its warm expression convey an impression of serenity and the cessation of movement. The ovoid face has slightly open, bow-shaped lips, rounded cheeks, and a high hairline; the nose is now broken. The curls of the hair are raised, not incised, and the ushnisha is low-domed. The neck is relatively long. The samghati (robe) which clings to the Buddha’s body is indicated only by incised lines showing its round collar, a small fold of fabric flung over the shoulder towards his back and the narrow stripes formed by the thin folds of light fabric draped over his legs . The Buddha is seated in the lotus position, with the soles of his well-fleshed feet turned upwards. 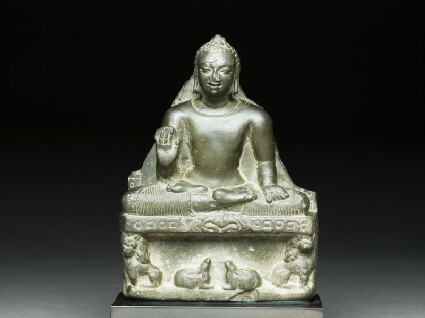 His right hand is in abhaya mudra or the gesture of protection. The left hand is held palm upward in the varada mudra of generosity; the ends of the extended fingers are now broken off. 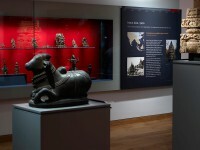 The throne-supporting lions are shown in profile with voluminous manes, while the two gazelles raise their heads to the empty central space representing the Wheel of the Law, a treatment which recalls the base of the shrine of Tukan-Bahal in Kathmandu . It is also possible, however, that the gazelles are turning their heads to hear the Buddha as he preaches the sermon in the deer park at Sarnath. Originally the image would have had a prabha (surround) with geometric marks similar to the alternating circles and squares which decorate the front of the throne. A single letter incised on the back near the upper shoulder is apparently a later addition . 2 This emphasis on the raised collar of the samghati is typical of this period in Nepal: see e.g. the seated stone Buddha dated to the sixth century in Pal, op. cit., pl. 181, also Béguin and Held, Népal: Vision d’un art sacré, pls. 131-2, and the standing stone Buddha at Pashupatinath (see Introduction). 3 Slusser, Nepal Mandala, pl. 224, and Pal, op. cit., pl. 182. 4 I thank Dr Gautam Vajracharya for his opinion that this syllable is ra and was probably carved around the sixteenth century or even later; it does not conform to the epigraphy of the Licchavi period.